The iconic Penang Bridge will soon turn 33 this year. It was first opened to the public on 15-September 1985. At 13.5 km, it was at one time the longest bridge in South East Asia and third longest in the world. Back in the ‘80s, Malaysia was a country full of optimism and potential. Prime Minister Dr. Mahathir Mohamad had good reasons to be proud of his country. Less than 30 years after becoming a self-governing country, Malaysia was putting itself on the world’s map, all for the right reasons. 1985 saw Malaysia achieving double milestones – the opening of the region’s longest bridge and launch of our first national car; Proton Saga. Several years later, we connected both ends of the Peninsular with the North South Highway, still one of the best highways in Asia (unfortunately the same can’t be said about the drivers). Malaysia was, without a doubt, one of the world’s most progressive developing country. Remember that the country was barely even 30 years old. 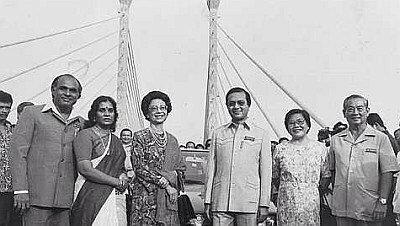 To celebrate the twin milestones, Dr. Mahathir and his wife Dr. Siti Hasmah had on 3-August 1985, took a drive across the newly completed Penang Bridge one month ahead of its public opening, in a red Proton Saga. Keen observers who remembered the specifications of our first national car will notice that this particular Saga was the entry 1.3S variant, as indicated by the absence of the passenger-side mirror. It’s a feature that we take for granted these days but back in the ‘70s and ‘80s, you would have to pay extra for side mirrors. Mahathir had started his drive from Perai together with his wife. 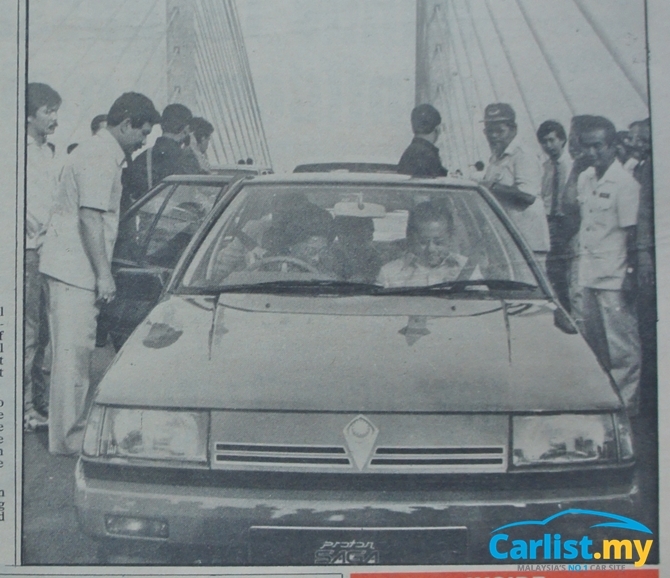 Sitting behind in the car were the then Works Minister Datuk S. Samy Vellu, Penang Chief Minister Dr. Lim Chong Eu, and Proton Chairman Tan Sri Jamil Jan. Photos from our archives also show that Dr. Mahathir’s Proton Saga was followed closely by a Volvo 240 Series, which in the era before the Proton Perdana, was the default car used by government agencies/ministries. As Malaysia’s oldest locally-assembled car marque (since 1967), Volvos were the preferred car for senior ranking civil servants. 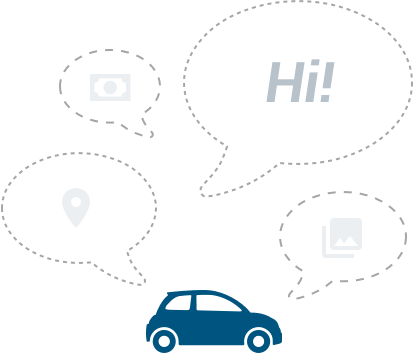 Mercedes-Benzes and BMWs were already locally-assembled by then but the former had too much of a businessman ring to it while latter’s image centred on enthusiast drivers. Doctors, university chancellors, government officers, basically people whose job was to serve the people, generally preferred a Swedish Volvo. At the end of the drive, Dr. Mahathir hosted a brief session with the assembled members of the media before returning back to Perai, this time with Dr. Siti Hasmah driving. 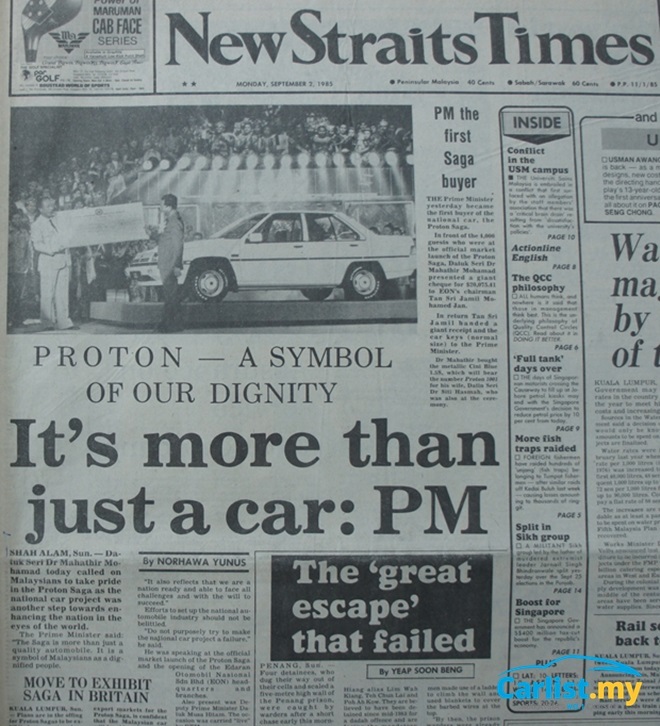 The historic drive also served the purpose as a teaser/promotional drive for the first Proton, which would only be launched several weeks later on 28-August 1985. Four days after Mahathir’s drive, Proton would launch a nationwide ‘Sagarama’ tour with two Proton Sagas - BCH 1351 and BCH 1352. The cars would eventually cover over 4,109 km without breaking down, a demonstration of the Proton’s durability. Did you know that the Penang Bridge was designed to last for 400 years and can withstand earthquakes of up to 7.5 magnitude on the Richter scale? Barring any man-made circumstances like an intentional sabotage or having a large ship ramming into one of its towers, it will stay intact for many more generations after us. Construction began on 11-January 1982, by Korea’s Hyundai Engineering & Construction Co. Ltd. and Malaysia’s own United Engineers Malaysia (UEM). The bridge was designed by a homegrown talent – the late Tan Sri Prof Chin Fung Kee, a geotechnical engineer and former acting Vice-Chancellor of Universiti Malaya (now Universiti Malaysia). The man who pushed forward the ambitious proposal to build a bridge connecting Penang Island with Peninsular Malaysia was the late Tun Dr. Lim Chong Eu, the former Chief Minister of Penang.  Prior to that, the only connection between the island and the mainland was the ferry service, which was slow and heavily congested. Like many engineering projects of this scale, the risks were high and more than 20 workers died in the course of building the bridge. At its peak, over 2,300 workers including 800 Koreans were working on the project. The final cost of the Penang Bridge totaled RM 800 million. In comparison, the Proton Saga project had cost the government RM 405.4 million. Today, Penang is linked to the mainland by two bridges. The Sultan Abdul Halim Muadzam Shah Bridge, which locals refer to it as simply the Penang Second Bridge, was completed in 2006 to alleviate traffic congestion on the original Penang Bridge, and it spans across an even longer distance of 24 km.